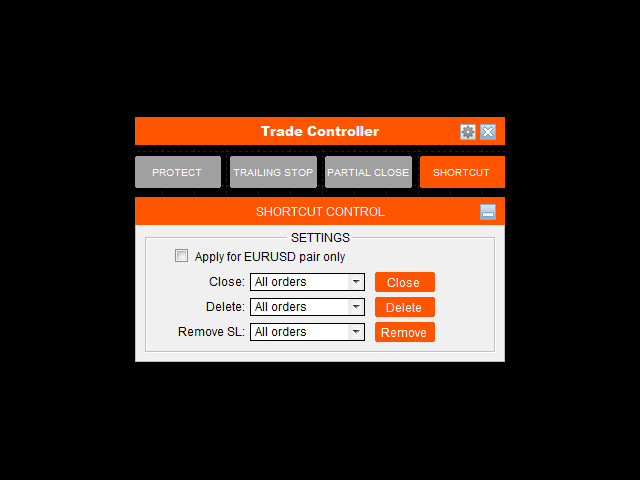 Trade Controller provides multiple methods to protect and maximize your profits. 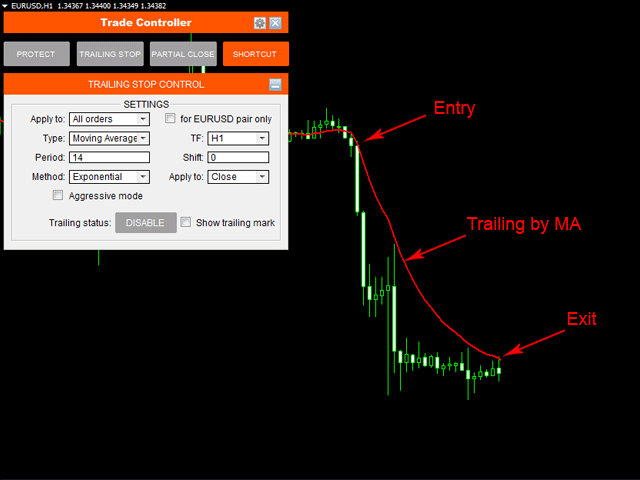 This powerful weapon helps you to set the protect and trailing-stop rules on your trade automatically in many effective methods. Once it is set and turned on, you don't need to monitor your orders anymore, the software will keep watching and control your orders with your predefined rules. It's designed to support multi-protection and trailing strategy: Protect by break-even, protect by percentage, protect by pip, protect by account value, trailing by distance, trailing by indicators, etc. 4 main control panels: Protection, Trailing Stop, Partial Close and Shortcut. Each panel features various options. Allow to apply multi-protection and trailing-stop rules at once by running it on multiple charts (on "First Come, First Served" basis). Control all orders on all symbols with one tool in single chart, no need to attach tool to every chart. Restore previous settings after shutdown or power-off. Apply to: Choose which kind of orders will be protected, there are some options: All orders, Buy orders, Sell orders, Custom ticket order, Custom magic number order, Account value. For current pair check box: Check this box if you only want to apply protection on selected orders (by Apply to) for current pair only. Type: Protection type that will be applied. Basic: When order make profit at X points, then stop loss will be moved to Y points from EP. Profit/Loss distance: Set a fixed distance at which selected orders will be closed. Profit/Loss percent: Set a fixed profit/loss percentage at which selected orders will be closed. Profit/Loss amount: Set a fixed amount of money at which selected orders will be closed. Drawdown/Growth %: Set a fixed entire account drawdown/growth percent at which all opening orders will be closed. Drawdown/Growth $: Set a fixed entire account drawdown/growth amount at which all opening orders will be closed. Protect status button: Enable/Disable Protection by clicking on this button. Protection takes effect in real-time with its current settings and Protection status immediately. If you want to view other settings without taking effect, just disable Protection before change. Apply to: Choose which kind of orders will be stop trailed, there are some options: All orders, Buy orders, Sell orders, Custom ticket order, Custom magic number order. For current pair check box: Check this box if you only want to apply trailing on selected orders (by Apply to) for current pair only. Fixed distance: This is like common trailing method that MT4 provide. But it's even better since you can set a distance smaller than Stop/Limit level, that means Stop/Limit level set by broker is skipped now. Moving Average: Moving average can be used in many ways for trailing stops. MA trailing is a pretty fast to lock profits. Trailing with MA High/Low is also a good idea. Parabolic SAR: Using PSAR is a safe way to trailing. It's a long runner if you catch a trend. Zigzag channel: Zigzag channel is made from the boundary of zigzag swing points. Like PSAR, Zigzag channel is a "slower but longer" trailing. ATR value: Average True Range (ATR) determine the average volatility of price at the meantime. So, trailing based on its value is favorite choice of many traders. Aggressive mode: Check this box if you want to trail stops from the order's opening based on price value (original stop loss distance may be reduced step by step). Unchecking this box will make trailing-stop to take effect only when trailing-point makes profit only. Show trailing mark: Checking this box will show the indicator mark on the chart that reflect the selected trailing method. Trailing status button: Enable/Disable Trailing by clicking on this button. 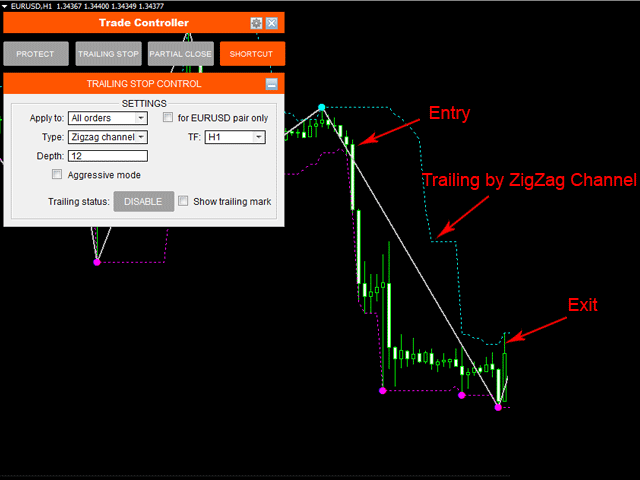 Trailing takes effect in real-time with its current settings and Trailing status immediately. If you want to view other settings without taking effect, just disable Trailing before change. Apply to: Choose which kind of orders will be partially closed, there are some options: All orders, Buy orders, Sell orders, Custom ticket order, Custom magic number order. For current pair check box: Check this box if you only want to apply partial close on selected orders (by Apply to) for current pair only. 1st Close: Choose X percent of order's volume to be closed for the first time whenever the order makes profit of A points from EP. 2nd Close: Choose Y percent of order's volume to be closed for the second time whenever the order continues to make profit of B points from EP. 3rd Close: The rest volume of order will be closed whenever it continues to make profit of C points from EP. Partial close status button: Enable/Disable Partial close by clicking on this button. Partial close takes effect in real-time with its current settings and Partial close status immediately. For current pair check box: Check this box if you only want to apply the shortcut command for the current pair only. Close: This shortcut is used to perform close command on selected opening orders: All orders, Buy orders, Sell orders, Winning orders (Profit+Commission>0), Losing orders (Profit+Commission<0). Delete: This shortcut is used to perform delete command on selected pending orders: All (pending) orders, All Buy Stop, All Sell Stop, All Buy Limit, All Sell Limit. Remove Stoploss: This shortcut is used to remove stop loss from selected orders: All orders, Buy orders, Sell orders, Winning orders, Losing orders, Pending orders. To view trade statistic panel, just go to Setting menu --> Show trade statistic. This panel helps you to overview your account statistics in the mean time, which includes Buy orders, Sell orders, Winning orders, Losing orders, Total potential SL and Total potential TP. To move this panel, just click on Move icon on the right and place the panel wherever you want on chart. Brilliant!! Helpful in retrieving a bad situation as in a current case with large floating drawdown. Not exactly sure how it manages but churns out successive winning trades without a single loss, helping to shore up my accounts till the drawdown is reversed. It´s a great tool. I use it combined with my custom indicators and it fits perfectly all my requirements ! Excellent! Product is great, exactly as promised. When you need help: seller is very polite and explaines very clearly with patience :-). Would defenitely buy again! - Improved: Allows multiple order tickets, magic numbers and comments for order filter. - Fixed: Eliminate conflict when manual remove stoploss that set by EA. - Fixed: Remove all graphic objects after exiting. - Fixed: Correct the "Profit/Loss distance" protection. - Added: "Order comment" filter. - Added: Start point of basic trailing stop. - Improved: OnChartEvent() function is adaptable with MT4 version 4.00 build 971 (7 Jun 2016). - Fixed: "Zero divide" error when show trade statistic sometime. - Fixed: Infinite loop when close all orders with various symbols. - Improved: Apply CloseBy for "Close All" shortcut, which is more economic for the account. - Fixed: Agressive alert informing AutoTrading feature. - Fixed: Force to display all graphic objects to the front of the chart. They could be hidden at few low RAM computers with previous version. - Fixed: Expert Advisor's status message correction. - Fixed: Eliminate potential zero divides. - Improved: Better partial close management. - Fixed: Correct partial close for mininal lotsize. - Fixed: Removed unnecessary alert. - Improved: Allows to control non-existing magic number order (for further orders).